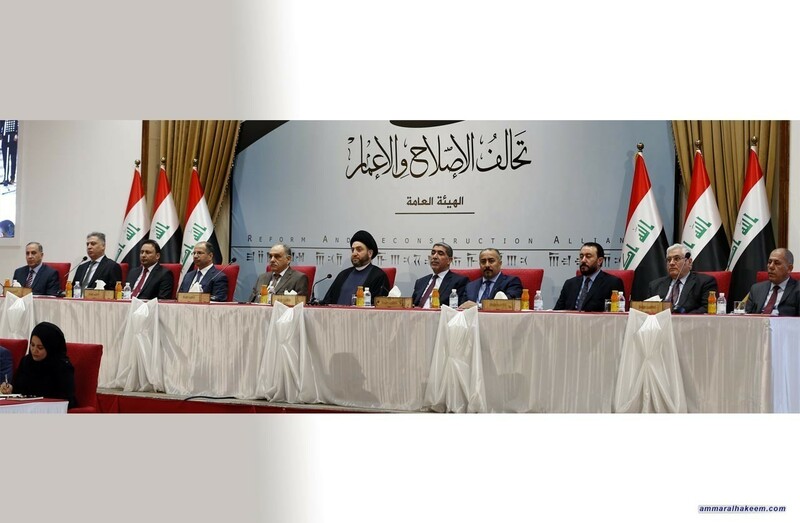 Head of the Al-Hikma National Movement, Sayyid Ammar al-Hakim, in a speech to the first meeting of the General Assembly of the the Reform and Reconstruction Alliance held in his office in Baghdad Wednesday 26/9/2018 pointed that the Reform and Reconstruction Alliance is not a temporary or periodic alliance, but it is the beginning of a national project with a clear vision towards the future towards 2022 and 2026, pointed out that the Reform and Reconstruction Alliance had great achievement at which a a project draft was formulated and encourage the remaining parties to allyamong each other, pointed to the importance of moderation as a fundamental feature and nationalism as a foundation and basis for this project. Hi eminence pointed that the Reform and Reconstruction Alliance is characterized by diversity and a balanced presence of actors the Arabs and Turkmen, Muslims and non-Muslims, Sunnis and Shiites and a number of Kurds, stressed on institutional work citing that the alliance was able to hold three meetings in a short period, noted the importance of completing meetings of the alliance political body, the completing assembly of committees and consolidating positions towards the upcoming entitlements, stressed that the strength of the alliance lies in its unity, plus amphasized the importance of adherence to constitutional deadlines. His eminence renewed encouragement to Kurds to conclude nominating the candidate for President position, and explained that the candidate should receive sufficient support commensurate with the nature of the post where as a front of Iraq to the world, indicated the importance of legal measures for representative's movement between political blocs considering that the system is parliamental and voters vote for a specific list and project, his eminence called for completing the government program of the Reform and Reconstruction Alliance by unifying the electoral programs of the evolved political blocs. The conferees concluded a number of points including the importance of communication with the remaining political blocs, unifying the government program of the alliance, avoid quotas, preservation of balance and set deadlines for the projects to be implemented, forming the women's bloc within the alliance and expedite drafting the internal system to be voted upon, complete the process of institutionalization and distribution of roles, and nomination of competent personages for governmental positions, empower women, and address the crisis of trust between the citizen and the Council of Representatives because of the continuous rumors regarding privileges.